Construction Progress in Old Lyme, CT | Joseph Bergin Architect P.C. I visited the building site of one of our current projects recently. This is a new house being constructed in Old Lyme, deep into a wooded flag lot with good acreage and such elevation as to provide distant, uninterrupted views as far as the eye can see. This site is at the very north edge of Old Lyme, bordering on Lyme, however yes – that’s Long Island Sound visible in the distance. 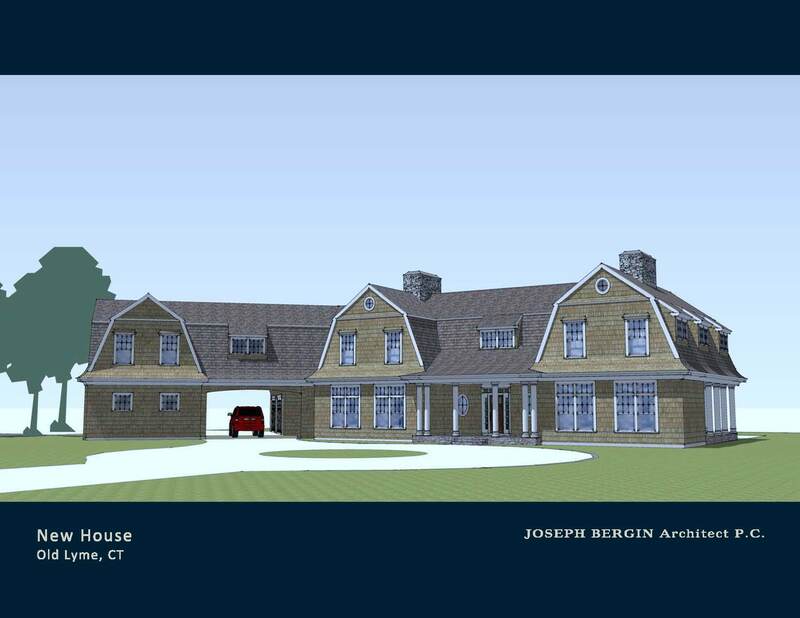 I’ve mentioned this project before, in a post about the gambrel style of roof. First below is a rendering that I shared at that point in time, followed by photos of the building under construction. Exterior trim is being applied to the many eaves and rakes (there are eight gables on this house) so that roofing may follow and window installation after that. Zach – much thanks – very grateful for your comment!